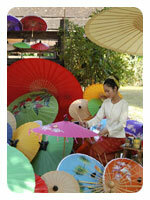 A paradise program for shoppers prepared and willing to enjoy the fun art of shopping. Folks, be sure you’ve got your credit cards and wads of lovely money….to splurge. 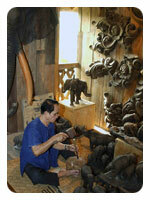 See exquisite native handicrafts actually being crafted by master craftsmen and their assistants. 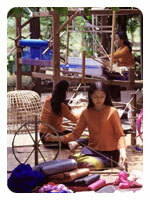 Elaborate teak-wood carvings, intricate silverware, lustrous black lacquer ware, high-fired ceramics, famous Thai silk and cotton being woven the ancient traditional way on rustic wooden looms, paper-making being done in the ancient traditional way, hand-made paper and silk parasols in a rainbow hue of dazzling colors. 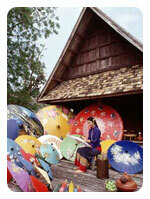 Watch skilled artists deftly and swiftly paint art-work on parasols. It’s absolutely amazing.